The thing with supporting the Villa is that the club is steeped in folklore, whether it be stories of gas lamps, the melting down of a lost FA Cup trophy or a star inter-war forward keeping chickens in his front room. The list can go on and on, but the story about Charlie Athersmith and an umbrella is something I thought I could actually look up and see if was true or not. 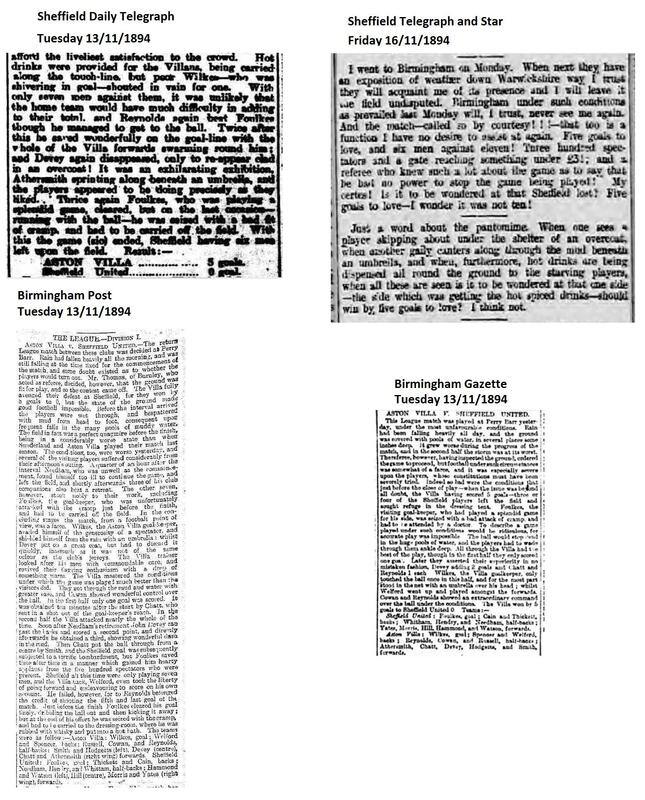 Below is a few newspaper snippets regarding the league game at Wellington Road on Monday 12/11/1894 vs Sheffield United (Villa won 5-0). Basically the local Birmingham papers failed to mention Athersmith running down the wing with the umbrella. However, the local Sheffield papers clearly states that it did happen. Apparently, it was a little bit chilly and a little bit wet! Early in the second half United went down to 10 men (Villa winning 1-0 at the time). Shortly afterwards, they went down to 9, then 8, then 7 men. We then started to rotate our players in order for them to have a warm drink from the trainer on the touchline (apart from poor old Tom Wilkes who was in goal, however someone from the crowd gave him an umbrella for his trouble). With the lack of numbers in the United attack, Jimmy Welford left his full back position and joined in the forward line. Jack Devey decided the best course of action was to reappear wearing an overcoat. Alas, this didn’t last long. The overcoat wasn’t claret and blue and so the skipper had to continue without it. Athersmith did indeed start playing down the wing with an umbrella in hand. However, he didn’t manage to get himself on the scoresheet. Just before the end the United goalie, Fatty Foulkes, got injured so they finished the game with 6 men. Foulkes had to be carried from the field (all 20+ stone of him). After the match, our Charlie, despite the use of the umbrella, was overcome in the changing tent and fainted. Brilliant research! Wonder why the game wasn't called off if they only had six men? Maybe they didn't have that rule then. and there's more! When the match ended the ref Mr Thomas from Burnley strode into the Sheffield Utd dressing room and sternly advised Yates and Morris that he was going to report them to the league for leaving the the field of play without his permission. Several of their colleagues chilled to the bone and shivering like Dickie Pride told him where to go in no uncertain terms.....and it wasn't Burnley!! On the train home some of the Sheffield team suffered from bad stomach cramps and then the Sheffield powers that be took the matter to the league but lost their case and the win and points were awarded to us. There is a full report of the game in this months edition of Carl Chinn's Brummagem Magazine. I refuse to believe this urban myth because I can find no evidence it ever happened on either Youtube or Twitter. Brilliant research showing it was a game in 1894. Wikipedia, Villa site, Simon Page, and The Sunday Times have all done pieces incorrectly reporting the game as being 1901. Location: Couché dans le caniveau en regardant les étoiles. Looks like rehash of a previous article, with a 1901 reference - doh!. At least we know better. As we are now aware the umbrella was used towards the end of the match not early in the second half and the fact that Charlie fainted away on his return to the dressing room tent suggests that he used the umbrella to keep the freezing sleet off him not as something to amuse the crowd.No mention at all of our great captain John Devey wearing an overcoat for the last part of the game either!